macOS Sierra was launched yesterday, and with it came a new version of Safari, Safari 10. Along with new features like Apple Pay, Safari 10 in Sierra introduces changes in the way it allows Flash content to run. Flash is now off by default but it can be easily enabled for each site that needs it. At this point the .swf file is not yet loaded. In our tests the .swf file was missing from both Safari’s Web Inspector > Network tab and Apache’s access logs. Clicking Once refreshes the page with Flash Player turned on. Once also means that if you close the tab you will be prompted to run Flash content again on the same website. Clicking Every Time adds the site to a list with all the websites allowed to run Flash content. 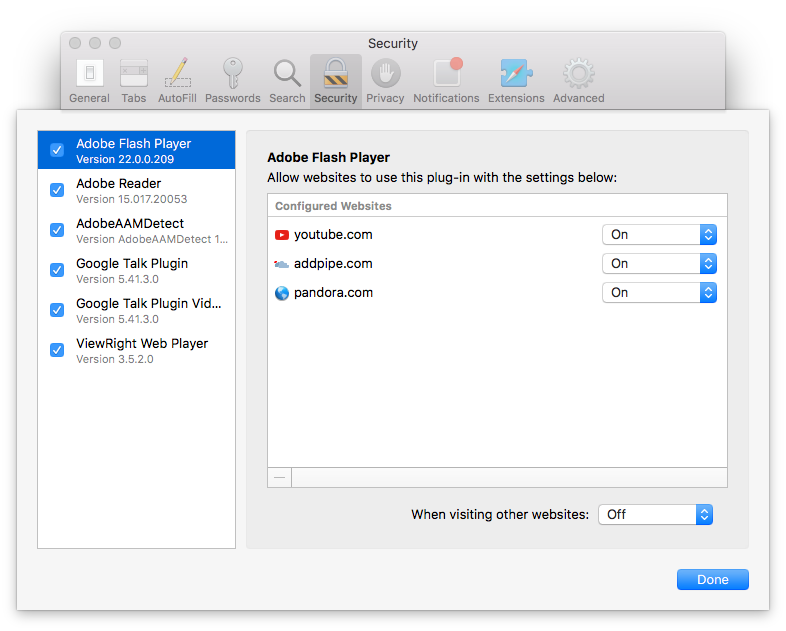 The list can be accessed at Safari > Preferences > Security > Plug-in Settings… > Adobe Flash Player together with the default value (Off, On or Ask) to be used for all other sites. If you allow Flash content on www.example.com you will be prompted to allow it on example.com and/or forum.example.com. If you use any kind of Flash Player detection in place like SWFObject, Flash Player will NOT be detected – since Flash Player is now by default Off for all websites – leading your web page to show the alternate content/HTML version (if any). In most cases the alternate content is actually a link to download & install Flash Player from http://www.adobe.com/go/getflashplayer. This link hijack is sure to create confusion among Safari users. 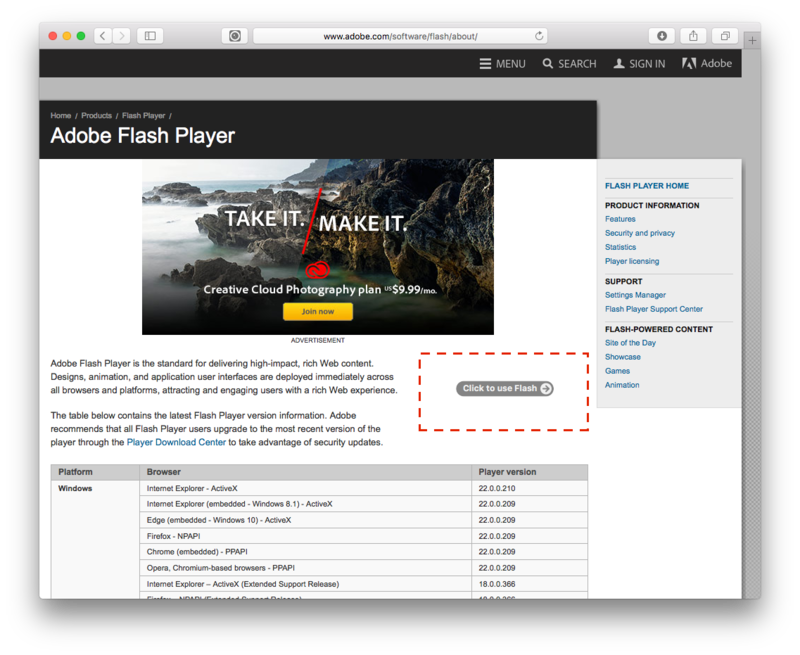 Safari Power Saver – pauses cross-site ad-like plugin (Flash) content – introduced as part of OS X Mavericks in 2013, is still present and enabled by default in Safari 10 on macOS Sierra. Chrome 45 also introduced cross site Flash content pausing in 2015 (here & here). Back in May 2016 Google outlined a plan named [HTML5 by default](https://docs.google.com/presentation/d/106_KLNJfwb9L-1hVVa4i29aw1YXUy9qFX-Ye4kvJj-4/edit?pref=2&pli=1#slide=id.g1270f83468_0_30) to push HTML5 by default in Chrome in Q4 2016 in a very similar way to how Apple implemented it in Safari 10. Yesterday, in a new post on the Chromium-dev mailing list, Anthony LaForge revealed that Chrome 55 will indeed turn off Flash by default but only for sites that are not frequently visited (based on their Site Engagement score). A much less stricter approach than Safari’s. My recommendation is to remove any kind of Flash Player detection and directly embed the Flash content. When Flash content is embedded using object/embed tags Safari 10 will show the Click to use overlay, and correctly instruct the user to install Flash Player if its actually missing. That’s builds up to a much better experience than the one in which Flash Player detection is involved. The Click to use overlay is an elegant solution but not advertising Flash Player’s presence will affect visitors of at least 2.1M websites who use SWFObject for Flash Player detection, sites that are now forced to change their code to avoid a bad user experience. Safari is thus taking a rather hard stance on Flash despite the fact that many (big) sites still use Flash and the fact that Safari doesn’t support many of the HTML5 features that are possible with other browsers including WebRTC and MediaRecorder API, thus leaving developers and users with no solutions for some use cases.